Even carbon fiber graphics make things feel lighter. In the racing world, carbon fiber is essential to make things go fast. While the Optrel p550 Series Carbon Fiber Helmet (1007.070) is carbon fiber in graphics only, it is still the perfect choice for students, DIY weekenders, and apsiring racing enthusiasts around the world. The P550 Series helmets use Optrel's advanced ADF lens technology with a wide-view viewing area and infinite shade level adjustment via external controls. 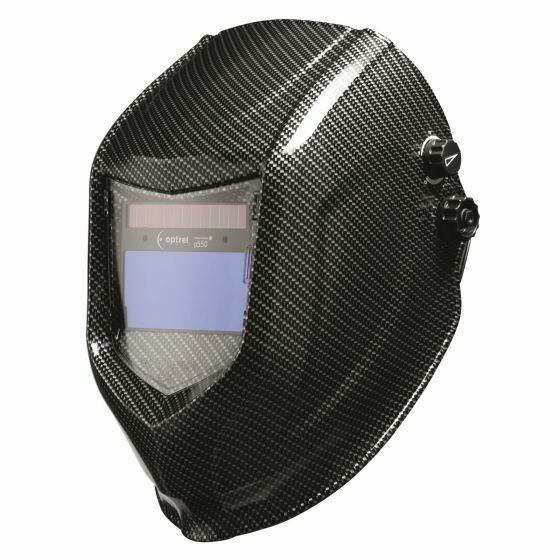 • Infinite Shade Level Adjustment – External controls enable welders to manually adjust their shade level to meet the needs of their welding application without removing their helmet. • Sensitivity Control – Welders working in close proximity to one another can adjust the Sensitivity of their ADF, preventing it from responding too soon or not at all to their arc flash. This can also be used when welding at low amperages and the ADF does not darken. • Opening Delay – The Opening Delay function allows welders to adjust the time it takes to switch from dark to light, making the transition easier on the eyes.